Dear all, I am very happy to announce the opening of registration for our OMG-Empathy prediction challenge. For this challenge, we designed, collected and annotated a novel corpus based on human-human interaction. This novel corpus builds on top of the experience we gathered while organizing the OMG-Emotion Recognition Challenge, making use of state-of-the-art frameworks for data collection and annotation. The One-Minute Gradual Empathy datasets (OMG-Empathy) contain multi-modal recordings of different individuals discussing predefined topics. One of them, the actor, shares a story about themselves while the other, the listener, reacts to it emotionally. We annotated each interaction based on the listener’s own assessment of how they felt while the interaction was taking place. We hope that with these resources we can contribute to the areas of affective computing and gesture recognition and foster the development of innovative solutions. I am very happy to announce the First? ?International Workshop on Affective and Assistive Robotics on the 18th of July 2018, organized in partnership with Prof. Bruno Fernandes (UPE) and with the??strong? ?support from Universidade de Pernambuco (UPE), Instituto de Inova??? ?o Tecnol? ?gica (IIT), CESAR and Parqtel. This full-day workshop unites academia and industry by bringing experts on the related topics from all over the world. We expect to foster discussions about the development and application of different affective and assistive robotic platforms over different scenarios. We host special invited speakers with different expertise in this field and an invited? ?interactive contribution session where young researchers will detail their most recent work. The ability to efficiently process crossmodal information is a key feature of the human brain that provides a robust perceptual experience and behavioural responses. Consequently, the processing and integration of multisensory information streams such as vision, audio, haptics and proprioception play a crucial role in the development of autonomous agents and cognitive robots, yielding an efficient interaction with the environment also under conditions of sensory uncertainty. Multisensory representations have been shown to improve performance in the research areas of human-robot interaction and sensory-driven motor behaviour. The perception, integration, and segregation of multisensory cues improve the capability to physically interact with objects and persons with higher levels of autonomy. However, the multisensory input must be represented and integrated in an appropriate way so that they result in a reliable perceptual experience aimed to trigger adequate behavioural responses. The interplay of multisensory representations can be used to solve stimulus-driven conflicts for executive control. Embodied agents can develop complex sensorimotor behaviour through the interaction with a crossmodal environment, leading to the development and evaluation of scenarios that better reflect the challenges faced by operating robots in the real world. 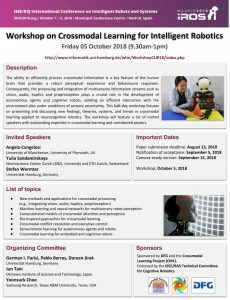 This half-day workshop focuses on presenting and discussing new findings, theories, systems, and trends in crossmodal learning applied to neurocognitive robotics. The workshop will feature a list of invited speakers with outstanding expertise in crossmodal learning. and related areas with the focus on crossmodal learning. 3. Submitted papers should be limited to *2 pages (extended abstract)* or *4 pages (short paper)*. Selected contributions will be presented during the workshop as spotlight talks and in a poster session. Contributors to the workshop will be invited to submit extended versions of the manuscripts to a special issue (to be arranged). Submissions will be peer reviewed consistent with the journal practices. 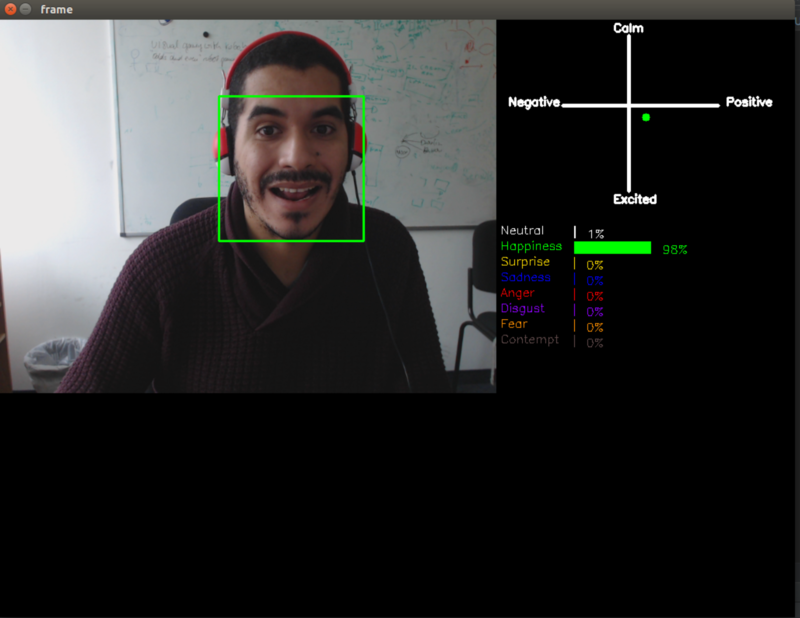 The final results of the 2018 OMG-Emotion Recognition Challenge are out:??https://www2.informatik.uni-hamburg.de/wtm/OMG-EmotionChallenge/. The leaderboard will be permanently stored on our website, and it will provide a quick access to the results, the links to the formal descriptions and code repository for each solution. This will help to disseminate knowledge generated by the challenge even further and will improve the reproducibility of your solutions. results into one for valence and one for arousal. submissions from the iBug team. of unimodal and multimodal solutions. will remain on our website as it is. held in partnership with the WCCI/IJCNN 2018 in Rio de Janeiro, Brazil. train and evaluate your models. to submit their detailed research to a journal yet to be specified. their solution during the WCCI/IJCNN 2018 conference. Closing of the submission portal: April 13, 2018. Announcement of the winner through the submission portal: April 18, 2018.
to be held in Rio de Janeiro, Brazil. Assistive technologies have the goal to provide greater quality of life and independence in domestic environments by enhancing or changing the way people perform activities of daily living (ADLs), tailoring specific functionalities to the needs of the users. Significant advances have been made in intelligent adaptive technologies that adopt state-of-the-art learning systems applied to assistive and health-care-related domains. Prominent examples are fall detection systems that can detect domestic fall events through the use of wearable physiological sensors or non-invasive vision-based approaches, and body gait assessment for physical rehabilitation and the detection of abnormal body motion patterns, e.g., linked to age-related cognitive declines. In addition to an adequate sensor technology, such approaches require methods able to process rich streams of (often noisy) information with real-time performance. Assistive technology has been the focus of research in the past decades. However, it flourished in the past years with the fast development of personal robots, smart homes, and embedded systems. The focus of this workshop is to gather neural network researchers, both with application and development focus, working on or being interested in building and deploying such systems. Despite the high impact and application potential of assistive systems for the society, there is still a significant gap between what is developed by researchers and the applicability of such solutions in real-world scenarios. This workshop will discuss how to alleviate this gap with help of the latest neural network research such as deep, self-organizing, generative and recurrent neural models for adaptable lifelong learning applications. In this workshop, we aim at collecting novel methods, computational models, and experimental strategies for intelligent assistive systems such as body motion and behavior assessment, rehabilitation and assisted living technologies, multisensory frameworks, navigation assistance, affective computing, and more accessible human-computer interaction. spotlight talks and in a poster session. The deadline for our special issue on Crossmodal Learning, hold by the Cognitive Systems Research journal, was extended to the 19.03.2018. I created this page to serve as a hub for my work and some hobbies. Here you can find a bit more about some academic information, projects I work(ed) on, publications,?? and current and past student orientations. Besides that, I will use this page for publicizing events or information which I may find interesting. I will also use this space to host some information of some of my hobbies, including video gaming, RC Cars,?? and the development of applications for DIY and commercial robots. I will try to update this page as soon as things are happening.